Proud supporter of our U.S. Armed Forces! Welcome to Front Range Patrol, we are Colorado's Premier Protective Services specializing in Commercial, Residential and Property Asset Protection. I am confident that we can provide your business with the highest and most effective type of security offered today for an affordable rate. Being the leaders in the security industry, Front Range Patrol is setting the "standard" of how the industry operates in the Denver Metro and the entire front range areas, we can offer competitive pricing with a higher quality of service. As a business consumer, you want only the best when choosing a security company for your needs. 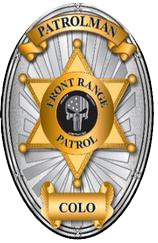 Front Range Patrol was founded and incorporated in 1991 by John Arundale and has since then, maintained an outstanding reputation over the years with both the local law enforcement and our clients. I am confident that we can provide immediate results on your property that will create a more secure environment for your residents or customers. Front Range Patrol is fully "licensed and insured" so that we can accommodate all of your security needs. Our team of highly trained and motivated staff are dedicated in all phases of personal protection and security in order to provide the most professional service for you, your residents and customers. Pick a topic from the top left side.